It is said that a Chickasaw chieftain, fearful of a white man&rsquo;s admiration for his lovely daughter, journeyed far from the plains to bring her to The Blowing Rock and the care of a squaw mother. One day the maiden, daydreaming on the craggy cliff, spied a Cherokee brave wandering in the wilderness far below and playfully shot an arrow in his direction. The flirtation worked because soon he appeared before her wigwam, courted her with songs of his land and they became lovers, wandering the pathless woodlands and along crystal streams. 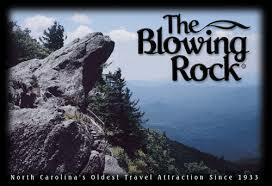 One day a strange reddening of the sky brought the brave and the maiden to The Blowing Rock. To him it was a sign of trouble commanding his return to his tribe in the plains. With the maiden&rsquo;s pleas not to leave her, the brave, torn by conflict of duty and heart, leaped from The Rock into the wilderness far below. The grief-stricken maiden prayed daily to the Great Spirit until, one evening with a reddening sky, a gust of wind blew her lover back onto The Rock and into her arms. From that day a perpetual wind has blown up onto The Rock from the valley below. For people of other days, at least, this was explanation enough for The Blowing Rock&rsquo;s mysterious winds causing even the snow to fall upside down. Today, visitors to the Blowing Rock Attraction can walk out atop the observation deck and see excellent views of the Blue Ridge Mountains and Johns River Gorge. Most often remark at the strange, high wind pattern that exists atop this location. The views jut out 1,500 feet above the gorge and it&#39;s easy to believe the ancient story that is still told at the Blowing Rock Attraction. Contact A1 Mountain Realty for your NC Real Estate needs. Come to our area of the High County and experience the charm of untouched Blue Ridge Mountain beauty. You&rsquo;ll find all types of Real Estate in Western North Carolina, lots and land for sale to create your own private mountain retreat near the New River, Blue Ridge Parkway, or any of these fabulous golf courses. Be sure to check out our website www.a1mountainrealty.com and browse our listings or do a MLS search for any property in the High Country region. While on our site be sure to check out our recently installed webcam, just click on the Downtown West Jefferson Webcam and you&#39;ll be able to see the downtown area and the beautiful towering Mt. Jefferson. ← West Jefferson is Full of the Arts!